…but sorry they aren’t edible. 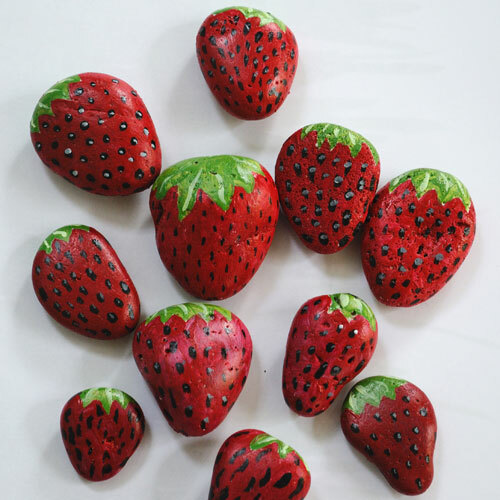 We found this great idea from a Facebook post recently, to paint a strawberry pattern on rocks. Apparently, if you place them around your strawberry plants, they will prevent birds or other annoying pests from stealing your strawberries before you can. I don’t exactly know how this works, but we decided to give it a try. 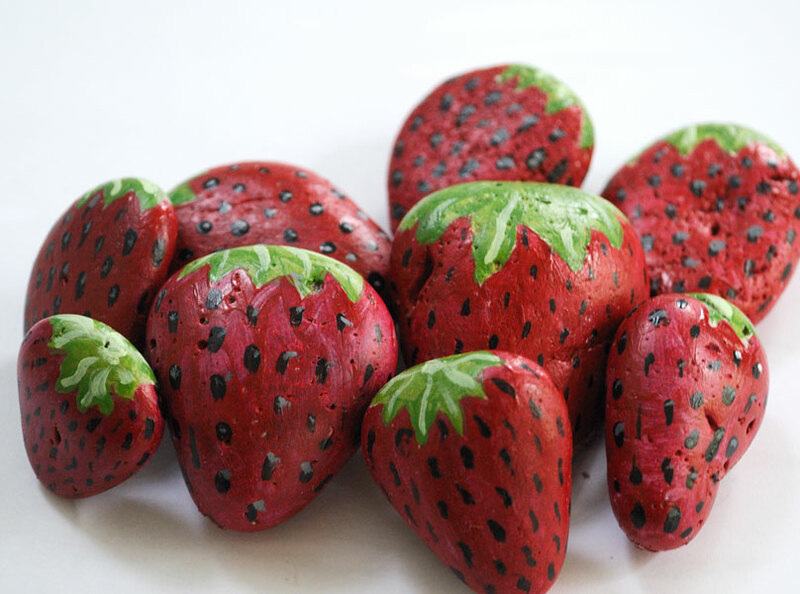 To start off with, select about ten smooth, strawberry shaped stones. Make sure you have purchased, or already own, outdoor acrylic paint in red, black, white, and green. Set up a work area, with a few thin paint brushes, a cup of water, some newspaper to cover your table, and a few paper towels to dry your brushes. Paint one side of your stone with red paint, but be sure to leave the stone showing through in a leaf pattern at the top. Leave it to dry. Once the red paint on the first side has dried, flip it over and paint the back side red, filling in all unpainted space. 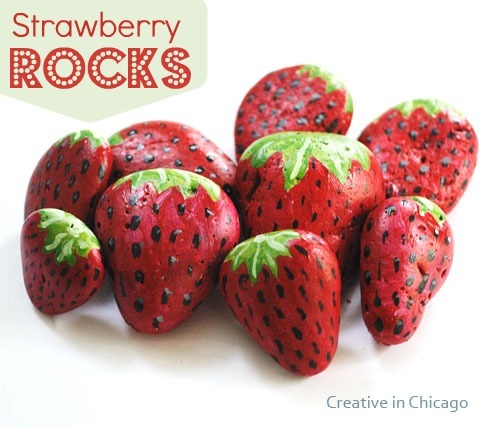 By now the only bare stone showing should be a leaf shaped pattern around the top of your strawberry. 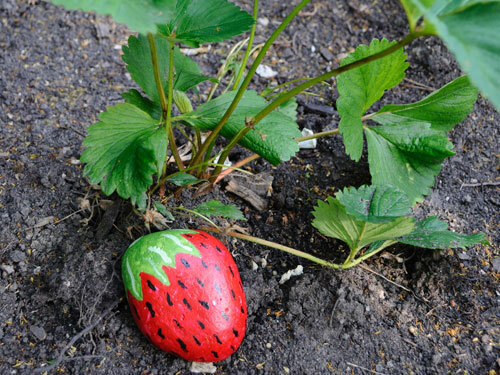 Now that you have painted the strawberries red, paint the top side of the leaf pattern you left at the top of your stone green. Leave it to dry then flip the stone and paint the other side. Now, mix some white and green together to create a tint of your previous green, and highlight the leaves by painting short stripes and a dot in the middle. Remember to wait until one side has dried until doing the other. You’re almost done! It’s time to use black paint and a steady hand. Make sure you are using a thin brush and paint the seeds which are tear shaped( NOT CIRCULAR, try not to make that mistake)randomly across the stone, then leave it to dry and paint the other side. Yay you finished! We would love to see some pictures, and we’ll include them in this post if you email some to us. So how was it? Too hard? Easy? I’d love to see your opinions on this little project! This entry was posted in Craft Projects, Gardeing Tips, Garden, Garden Decor, Natural Materials, Teenager. Bookmark the permalink. Those are really cute!! I wonder how they work..
Not quite sure but they look so pretty in my strawberry patch! This is a really great idea! Robins adore strawberries and this would confuse them. I think they are attracted to the red color. It's also easy enough that the kids can help. Who knew? And they look so yummy! I am guessing that you put these out early, and the birds will try to eat them. When they realize they cannot, they will give up on that bed and when you do get strawberries, the birds will already be conditioned to think they are rocks. Cute! I need to get started with these — are strawberries are forming! Pinned it!